Another way to discover your dharma is by paying attention to synchronicities in your life. A simple definition of synchronicity that I like is “meaningful coincidence”. Another really neat definition I found is “a wink from the cosmos”. Synchronicities grab our attention. 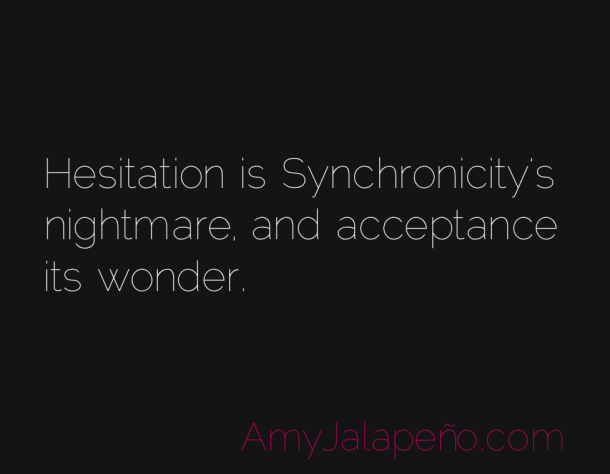 The occurrence of synchronicity was first brought to light by Carl Jung. He was treating a patient in his office, who was relating a dream she had where someone had given her a piece of jewelry in the form of a golden scarab. As she was relating the dream there was a sound at the window and when Jung opened it, a scarabaeid beetle was outside. He picked it up and showed it to the patient, saying: “Here is your scarab”. How odd that at the time she was relating the dream that the insect showed up! The fascinating thing about synchronicities is that they tend to repeat themselves or have specific impacts beyond mere coincidences. So when they appear in our lives they actually make us stop and pay attention, because they stand out in large ways. They can be linked to certain situations and people in our lives. These show up over and over and when they do, they could very well be clues that could lead one to figuring out where they are to go and what they are supposed to do in life. I recreated aspects of my life’s timeline and I could see the threads that led me to where I am today. Interestingly, these threads were more prominent in times when I was mentally free and open to possibilities outside of my former religious mindset. It’s almost as if the clearer I was, the more the synchronicities showed up. For most of my childhood, I loved to read and write. That’s a natural indicator for me where part of my purpose lies. But I was still unclear about what I wanted do in life. I do know I loved being in front of people, entertaining them. When I got to high school, out of the blue I auditioned for the school’s television station and was selected to be a news anchor. I was the first female to achieve that at my school. To this day I don’t know what Mr. Strickland saw in me, but he must have been moved enough to invite me into the boy's club. After high school, I left my very sheltered religious upbringing when I suddenly decided I wanted to be a model. I have no idea where that thought came from, because I was very insecure about my looks and under the height requirement. But once I went out there I found great avenues to explore. This led me back to television where I became a video jockey for a music station that was a rival to MTV. Then I started putting myself out there and doing talent shows and commercials. I was gaining a lot of exposure, so much so that friends started to encourage me to move back to Los Angeles. Everything was happening so fast, I was exposed to so much. So many interesting people came into my life at that time. But because of not having a strong temperament to navigate real life, I ended up back at home after four years out of high school, mentally and emotionally exhausted. I left all my friends behind and went back into the lifestyle I was raised in; thinking life would be safer there. Looking back I realize now in essence I had diverted my path by doing so and over the next twenty-two years I suffered because of that decision. But the path cannot ever be truly diverted, because within those years, the universe started to set me up, so that when I finally broke free, there were certain things in place that brought me right back on track. But I guess you’ll just have to come back for the rest of that story! Until then, start reflecting on your life. Do you see the threads of synchronicity? Are there situations outside of your childhood leanings that keep showing up? Are there people in your life who over time seem to be constantly popping into your life? They may be linked to your grand purpose in one way or another. Stay tuned for Part Three! Until then, live the divine life! no answer to my demands, I gave up the practice. Powers which I had set in motion did not forget. business in the West End of London." Enjoy the read, I certainly do! :) Live the life and enjoy! That’s why I K.I.S.S. - Keep it simple, silly! Ask only for what I need! Makes life very easy and enjoyable! And talking about synchronicity: That image at the top of the post, I found on a blog belonging to a beautiful soul who shares a similar life story as mine. Out of thousands of images, hers got my attention! Synchronicity at play! Have a great day my friend! And as always THANK YOU for reading!